Jake Vo is all in from the big blind for 345,000, and has been called by Dale Beaudoin in early position. The board runs out J♠8♦7♦4♥9♦ awarding Beaudoin the pot, and eliminating Vo in 11th place. David Shiranian was just eliminated by Carlo Sciannameo. Shiranian shoved for 500,000 holding A♦8♦, and Sciannameo called holding A♣10♣. The board ran out A♠5♥2♠7♦10♦, giving Sciannameo two pair to eliminated Shiranian from play. 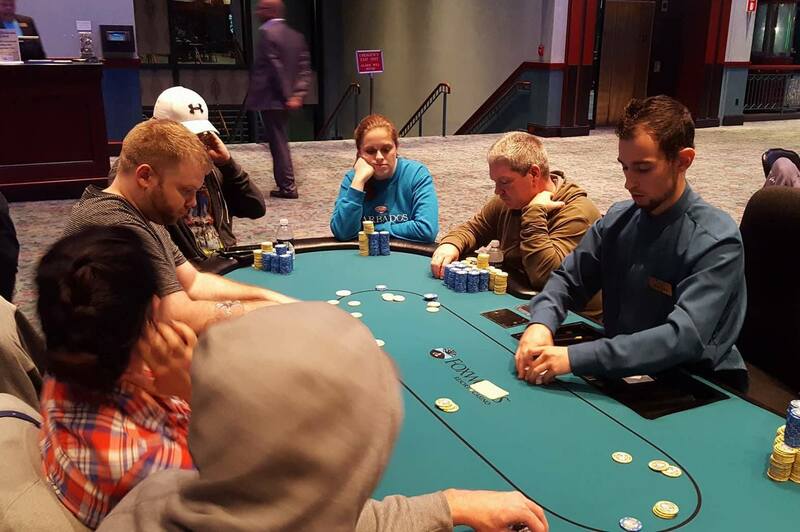 Dale Beaudoin recently eliminated both She Lok Wong in 13th place ($5,144), and Ryan Gebow in 14th place ($5,144). After the double elimination, Beaudoin now has the chip lead, and is the first player to cross over the 4-million chip mark. 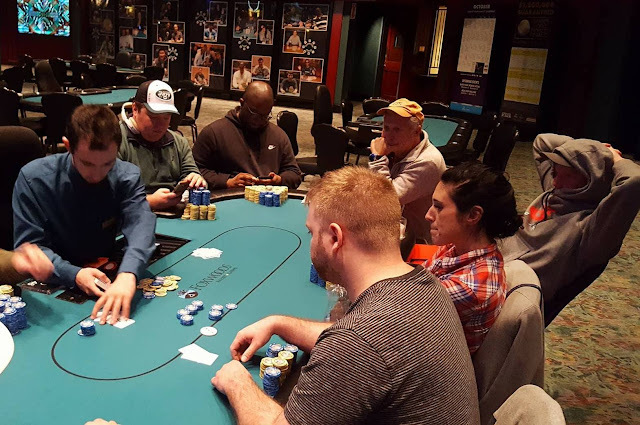 James Daniel is all in for 570,000 holding 7♦7♣, Stanley Lee is all in for 1,019,000 holding Q♠Q♥, and both players have been called by Daniel Colpoys holding K♦K♣. The flop comes A♠6♠3♠, leaving Colpoys in the lead with his pair of kings, but giving Lee a flush draw. The 8♣ turn does not change the hand, but the 10♠ river gives Lee the flush to double through Colpoys, while Daniel is eliminated in 15th place. As the chips are being counted down, Colpoys talks aloud about losing back to back 3-million chip pots. Paul Mondello was recently eliminated when he shoved all in for around 325,000 holding 8♥8♦, and was called by Dale Beaudion holding 10♦10♣. The board ran out A♦Q♣5♣A♠A♣ giving Beaudion the bigger full house to eliminate Mondello in 16th place. Stanley Lee raises to 45,000 in the hijack, and Daniel Colpoys calls in the cutoff. Michael Azzaro moves all in from the small blind, and it folds to Lee who asks for a count. Upon hearing the 139,000 total, Lee calls. Colpoys moves all-in over the top of Azzaro, and Lee quickly mucks his cards. The flop comes J♣9♠8♠, giving Azzaro a set of eights to take the lead. He maintains that lead when the turn comes the 6♥, but the 10♦ on the river gives Colpoys the queen high straight to eliminate Azzaro from play. Sean Miller II was just eliminated by chip leader Carlo Sciannameo. Miller got it all in holding A♣Q♠on a board reading A♠A♥6♥3♠. Unfortunately for Miller, Sciannameo had turned a full house holding A♦3♣, and Miller was unable to improve on the 4♣ river. Miller takes home $3,332 for his 22nd place finish, and Sciannameo is now the first player to cross over the 3 million chip mark. David Shiranian limps in from under the gun, and Guy Smith, who is next to act, also limps. It folds back to Kevin Currey in the big blind who checks his option. The flop comes K♠6♣4♥, and all three players check. The turn is the A♣, and this time Currey bets out 30,000. Only Shiranian calls. The river is the 8♣. Currey bets 50,000, and Shiranian pauses for a few seconds before tossing in the chips to call. Currey turns over 4♦4♣, for a set of threes, and Shiranian mucks without showing. The final 23 players in Event #1 are now on a 60-minute dinner break. 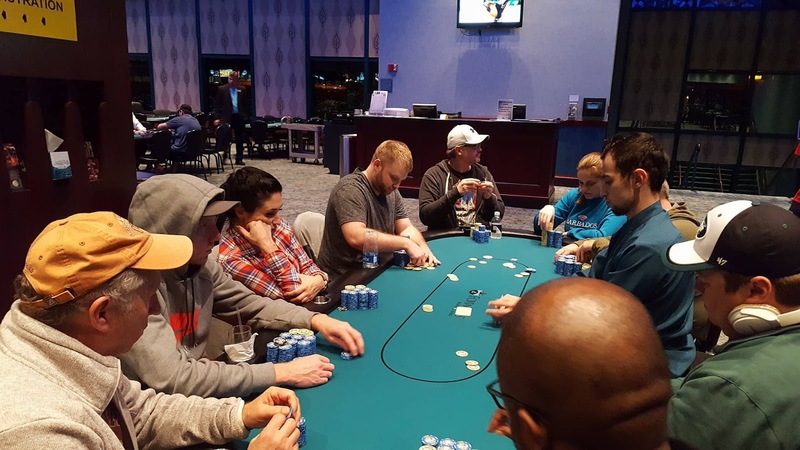 They will return to play Level 23, with 8,000/16,000 blinds, and a 2,000 ante. The average stack is 827,826. Play will resume around 7:40 p.m. ET. There were a total of 186 entries in today's $400 NLH Big Stack Bounty Semi Turbo event. Those entries generated a prizepool of $44,547, with 21 spots making the money. Will Failla was recently eliminated after he moved all in for around 10 big blinds after looking at only one card. Dale Beaudoin called and turned over K♥8♣. "That''s not good for me," Failla says, "I have a king." He then turns over both of his cards to expose K♣6♥. "Chop," Failla calls for as the flop comes Q♠7♥3♣. The turn is the J♠, and Failla says, "No chop," as he stands and starts collecting his belongings. 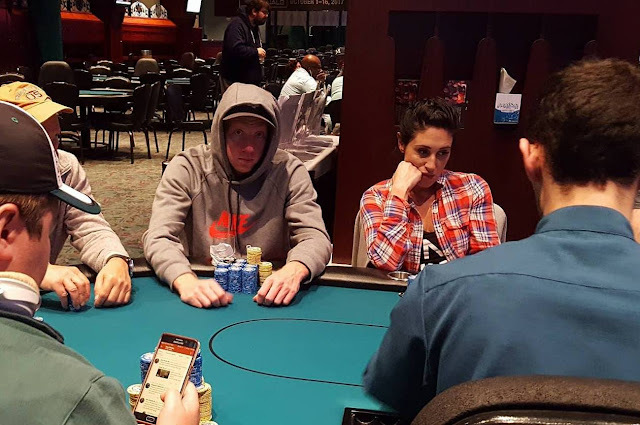 The river is the 5♠, and Failla is eliminated in 37th place. Caleb Clarke raises to 24,000 in middle position, and the hijack moves all in for 109,000. The small blind tanks for over a minute before folding, and the big blind folds as well. With action back on Clarke, he moves chips forward to call. The flop comes J♦7♠5♦ improving Clarke's lead when he makes a pair of jacks. The 2♦ turn and 3♣ river are also safe for Clarke, and his opponent is eliminated from play. The board reads 10♦9♣6♣, and there is around 50,000 in the middle. Carlo Sciannameo checks in early position, and Brenton Reihl bets 20,000 in middle position. Sciannameo raises to 50,000, and Reihl calls. The turn is the 3♦. Sciannameo bets out 70,000, and Reihl moves all in. Sciannameo sits back in his chair, and asks for a chip count. The dealer counts out Reihl's 305,000, and Sciannameo asks the dealer to pull in the 70,000. Sciannameo thinks for over two full minutes, before Reihl calls the clock on him. The floor walks over and gives the 30-second countdown. About ten seconds in, Sciannameo looks over at Reihl and asks, "230?" Reihl nods, and with three seconds left to act, Sciannameo tosses in the chips to call. "Nice call," Reihl says as he tables 7♠7♦. Sciannameo turns over A♠10♣ for a pair of tens. Unfortunately for Reihl, the Q♥ river does not improve his hand, and he is eliminated in 45th place, taking home $2,254. "Now you have 1.5," table-mate Matthew Wantman says to Sciannameo as the massive pot is pushed over to him. According to a few players at the table, a very odd hand just took place. A player under the gun had raised to 1,800, and there were three total callers. The flop came Q♣J♦T♥. The original raiser bet 1,800, and only Andres Benitez called (on the button). The turn was the A♠. The original raiser again bet 1,800, and Benitez raised to 9,000. The player called. The river was the K♦, putting the Broadway straight on the board. The original raiser checked, Benitez laughed a bit, and then moved all in. The player went deep into the tank. Nearly five minutes passed before someone called the clock. At the end of the countdown, the player hesitantly mucked his hand and said, "I folded a set." Benitez showed K♥3♥, and the pot was pushed over to him. Event #1, Day 2 - "He Was Trapping Ace-King"
Stephen Song was recently eliminated from play by Foxwoods regular Fred Paradis. According to table mate Will Failla, Paradis raised to 14,000, and Song made it 49,000. Paradis moved all in for 500,000, and Song quickly called for his remaining 350,000. "He was trapping ace-king," Failla says sarcastically. Song takes home $1,813 for his 59th place finish, and Paradis now sits with 850,000. The $1,200 No-Limit Hold'em Event begins this Saturday, October 7th at 11am. 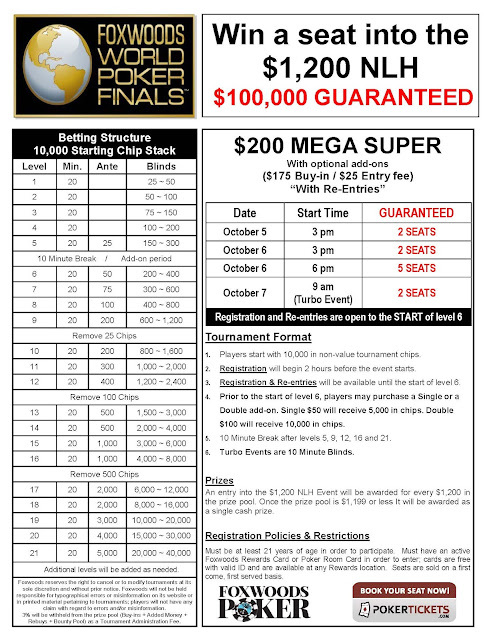 There are plenty of satellites to get into this event for as little as $200. Please see below for the satellite structure/schedule. The final 77 players in Event #1 are now on their first 15 minute break of the day. They will return to play Level 19, with 3,000/6,000 blinds, and a 1,000 ante. The average stack coming back from break is 247,272, and Stanley Lee is still the far-away chip leader. Lee started the day with over a million in chips and has continued to build upon his stack. He is now sitting with 1,500,000, and still the only player to have crossed the million chip mark. Michael Lavoie is all-in on the button for 95,000, and has been called by Joe Cote in the big blind. Cote turns over A♣A♦, and upon seeing the bad news, Lavoie turns over K♦K♣ and stands up from his chair. The board runs out J♦5♠5♥4♥6♥, awarding Cote the pot, and eliminating Lavoie from pay. December Mega Stack Challenge is Coming! 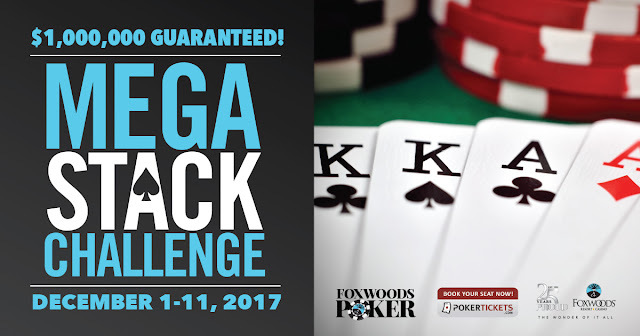 We are currently in the midst of the World Poker Finals series here at Foxwoods, but it's never too early to start looking ahead to the December Mega Stack Series. Mark your calendars for December 1-11th, and win some pre-holiday money in one of our amazing events taking place over the 11 days. Event details and structures will be posted when they are finalized. According to Mark Walsh, he was recently eliminated in 110th place. There were two limpers and one min-raise when it reached Walsh on the button. Walsh moved all in for 47,000, and the original raiser called. Walsh held poket fives, and was up against the pocket queens of his opponent. The board ran out K-10-9-8-2, and the poker professional was eliminated from play, taking home $1,200 for his showing. He is headed to the registration cage to enter in today's $400 Big Stack Bounty Semi-Turbo event. For a list of all players advancing to Day 2, please see this link. Late registration is open until the start of Level 11.